We are delighted that a poster featuring research on our 4M project was selected for oral presentation, won a ‘commended’ rosette and also won the BHIVA/BASHH Mediscript 2018 award for community research. 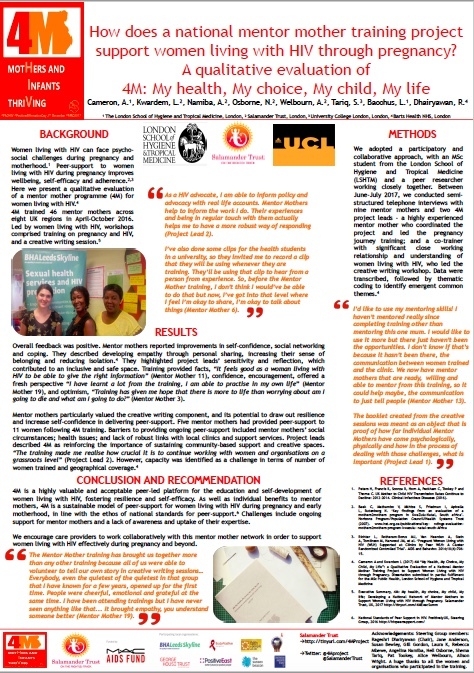 The qualitative research evaluation which the poster described was a joint team effort. It was conducted by Amelie Cameron and Longret Kwardem. Amelie was a Masters Student at the London School of Hygiene and Tropical Medicine (LSHTM), (supervised by Dr Loraine Bacchus). Longret Kwardem is a Salamander Trust Associate, and a peer researcher. The overall research was supervised from Salamander side by Dr Shema Tariq of University College London, who is a member and former Chair of our 4M Steering Committee.